Flair is a style of bartending that has existed for at least 150 years. Fabled American bartending legend Jerry "the professor" Thomas performed flair in the mid 1800s, whenever he made his famous Blue Blazer, pouring flaming scotch and water from mug to mug in a long, fiery stream. Any bartender who has ever put two or more bottles in one hand uses flair. Flair is simply efficiency of movement with a little pizzazz. Technically speaking, flair is the act of flipping, spinning, throwing, balancing, catching bottles, drinks, and various bar tools while in the process of making cocktails. Flair involves highly technical pours and cuts that ensure accuracy and no spillage while performing various tricks and moves. Speed bartending a form of flair in that the fastest, most efficient way to make drinks involves multi-bottle pours; inverted catches and grabs; stylish, martial-art like movements; and even behind the back throws and catches from time to time. What is the working flair? Working flair is the type of flair the FBA encourages on day to day bar shifts: quick, light, and realistic moves that can be performed without slowing service. 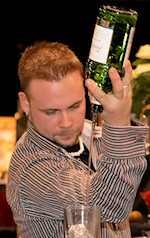 Most working flair involves glassware, one bottle, bottle and tin, garnish, or occasionally, two bottle moves. Working flair is always performed while making a cocktail or drink. Flipping empty bottles is not working flair. Exhibition flair is flair performed for entertainment and competition purposes and generally involves longer, choreographed routines. Exhibition flair usually requires special preparation and set-up of bottles and other props. It is a style of flair that generally does not lend itself to every day bar shifts. However, there are a growing number of flair bars around the world that showcase exhibition flair as part of their operation's entertainment. 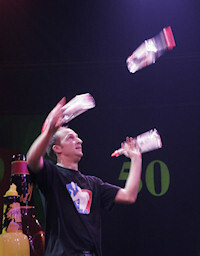 Exhibition flair often involves multi-object flair including 2,3,4 and 5 bottle/tin tricks and routines. Exhibition flair can involve moves and routines performed while not in the drink making process. There is no "correct" style of flair, just different styles. Certain styles are more accepted and more popular than others in different parts of the world. That is what makes the FBA so exciting. The FBA is bringing together bartenders of many different styles and helping to facilitate understanding, acceptance, and camaraderie amongst flair bartenders regardless of ability, style, or experience. The FBA does believe that service should always come first, before flair-but that flair is a very fundamental part of being a professional bartender. What is the mission of the FBA? To encourage the performance and sport of flair bartending with a strong foundation of accuracy and service. What does the FBA actually do? 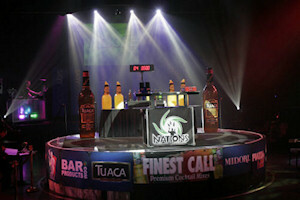 Organizes, supports, improves bartending competitions. Creates and maintains a community for flair bartenders worldwide mainly via the members lounge of our website www.barflair.org. Teaches the art of flair in workshops, seminars, and in our home towns to newcomers and veterans alike. Grows the sport of flair bartending throughout the world by promoting events, encouraging bartenders to compete in them, and getting the media to cover them. Acts as a liaison between bartenders, managers, owners, media, and industry organizations and corporations to educate them about the technical skill and dedication to service and sales professional flair bartenders have. Sends flair bartenders all over the world to train, demonstrate, perform, work, and compete. Writes for industry publications and consults on industry projects and beverage development with major multi-units and drinks companies. The original planning of a worldwide community of performance bartenders was a 1997 collaboration between American Flair Bartenders Alan Mays and Toby Ellis. Later in 1997, 30 other flair bartenders from the U.S. and Canada joined Mays and Ellis and founded the original network, the Flair Bartenders' Network (FBN). Some of the other founders and most involved members include Jim Allison, Dean Serneels, Rob Corujo, Stefan Notteboom, Philip Duff, Ken Hall, Jason Jelicich, Chuck Rohm, Joe Pereira, and John Fiore. By mid 1998, the FBA had grown to 250 bartenders in 24 countries. Today, there are tens of thousands FBA bartenders working in over 150 countries. Yahoo! Who belongs to the FBA? Bartenders who love to make drinks and love to entertain. Rookies. Veterans. Old-school purists. Modern day mavericks. Master bartenders and world champions. If you have ever seen a bartender toss something in the air, they are an FBA Member. Can you send me information on flair? All the information we can give away for free is on this website or contained in a link to some of the other great sites we've listed. For the real inside scoop, all you have to do is register and become an active member to have more information and resources on flair bartending than you could have ever possibly imagined! Where can I get videos? Join today and you'll have access to videos for sale in the online store that features flair from all over the world including exclusive footage you cannot buy anywhere else on earth. Does the FBA recommend bartending schools? No. We do not recommend one school over another. We do point out that some schools are much better than others. Before you spend any money, find out what the school has to offer. All top bartending schools these days offer flair training. Those that do not are out-of-date. (Flair training is now part of most major multi-unit chains, major resorts & casinos, and many high-volume, high-profile clubs. What is the secret to flair? How do I keep from spilling? Physics. Centrifugal and Centripetal forces. Visualize and practice keeping the liquid forced or "pushed" to the bottom of the bottle. Most moves travel in "arcs" and should lead by the base of the bottle. There are no special "trick" pour spouts. Don't try to flip bottles that are more than 1/4 full. You can flair bottles that are full, you simply cannot put a 360 degree flip on them. Practice. It will come to you. How bad do you want it? With all the support available through FBA membership, most bartenders can learn enough flair to make a little extra money on their shifts or place in competitions in a matter of a couple months. You just have to want it and be willing to do the work. With professional one-on-one training, you can shorten that time down to a few weeks. Join the FBA and you'll be able to locate professional trainers and top flair bartenders who live near you! How much does FBA Membership cost? Basic FBA Membership is completely free. To become a card carrying Premium FBA Member a small annual membership fee of $55 USD gets you full access to the world of flair. What does an FBA membership get me? Visit our registration page for more information on everything you get when you join the FBA. Spread the word. Teach others. Join us. Compete. Have fun behind the bar. Make great drinks and cocktails. Give amazing service. Send us any news related to bartending, particularly performance bartending. Don't ever let service suffer on your bar to perform flair. Represent the FBA with class, humility, and a sense of humor. How can I become an FBA Ambassador? Walk your talk. Get out there and help grow the sport. Have integrity. Leave your ego at home. Teach others. Tell us of your interest. Spread the word. Keep us posted of all your work. Make things happen.